GoHealth Urgent Care is going to open 15 new urgent care centers cobranded with Hartford HealthCare over the next 18 months. Hartford says it will benefit by bringing in a greater number of patients, by virtue of having more access points. GoHealth will have the benefit of technology standards like “smart glass” procedure rooms, mobile x-ray equipment, and a broader, unified electronic health records system. The partnership will also increase GoHealth’s visibility in central and eastern Connecticut. GoHealth Urgent Care and Connecticut's Hartford HealthCare will join forces to extend GoHealth Urgent Care's urgent care center network to Central and Eastern Connecticut. The two providers plan to open 15 centers beginning in spring 2017 during the first 18-month phase of their partnership. Each Hartford HealthCare-GoHealth Urgent Care center will treat patients seven days a week with extended evening hours, walk-in availability, and online check-in so that patients can save a place "in line." "The partnership will provide patients greater access to innovative high-quality care, where and when they need it most," GoHealth said in a statement. The centers will feature electrostatic "smart glass" procedure rooms, transparent charting on a wide screen in each exam room, mobile X-ray equipment and a unified electronic medical record that can be accessed by caregivers across the Hartford HealthCare network, GoHealth said. GoHealth Urgent Care operates roughly 60 urgent care centers in the New York and Portland, OR, and San Francisco Bay areas. GoHealth Urgent Care's current partners include Northwell Health, Legacy Health, Dignity Health, one of the nation's largest health care systems, headquartered in San Francisco, and now Hartford HealthCare. Hartford HealthCare includes a tertiary-care teaching hospital, an acute care community teaching hospital, an acute-care hospital and trauma center, two community hospitals, behavioral health services, a primary care physician practice group, as well as cancer centers, regional and senior home care and physical therapy rehabilitation. GoHealth Urgent Care and Hartford HealthCare announced a joint-venture that will extend GoHealth Urgent Care's proven model of convenient and consumer-focused urgent care centers to Central and Eastern Connecticut. This partnership will provide patients greater access to innovative high-quality care, where and when they need it most. GoHealth Urgent Care and Hartford HealthCare plan to open up to 15 co-branded centers within an 18-month first phase of their relationship, beginning in spring 2017. The centers will feature electrostatic "smart glass" procedure rooms, transparent charting on a wide screen in each exam room, mobile x-ray equipment and a unified electronic medical record that can be accessed by caregivers across the Hartford HealthCare network. The joint-venture will pair GoHealth Urgent Care's patient satisfaction ratings, technological advancements and award-winning center and website designs with Hartford HealthCare's high-quality, fully integrated acute and ambulatory health services. About 25 people, including local residents and elected officials, were on-hand for the grand opening of the Lynbrook Northwell Health-GoHealth Urgent Care Center on Jan. 21. The day’s festivities included a tour of the care center, a ribbon cutting ceremony and remarks from Hendrick and spokespersons for Northwell Health. The facility, which is located at 683 Sunrise Hwy., has a space for minor surgeries, four examining areas and rooms for drawing blood, Hendrick said. The Lynbrook location is the 16th care center to open up on Long Island. There are also facilities in Manhattan, Queens, Westchester and Staten Island. Adam Boll, the vice president of Northwell ventures operations, said the facility has been well received in Lynbrook. The care center is open from 8 a.m. to 8 p.m. Monday through Friday, and from 9 a.m. to 5 p.m. on weekends. Is It Actually Bad to Swallow Your Gum? There’s a lot to unpack here, so let’s start from the beginning. Cinnamon? I mean, no disrespect to cinnamon, but it’s a seasoning, not a main dish. It’s called the “cinnamon challenge” for a reason, and I for one find it incredibly alarming that our new Press Secretary can get through two and a half packs of the stuff. If we’re accepting the premise that it’s normal to eat gum,which I’m not fully on board with, either, I’d at the very least be willing to accept it with something a little more neutral, like mint. But what I simply cannot condone is the sheer magnitude of Spicer’s habit—two and a half packs. If we’re assuming there are fourteen pieces of gum in each box, that’s 35 pieces of gum (equivalent to, what I call, a “glob”) each morning. And that’s just the morning! What happens in the afternoon? Does his consumption continue at a steady rate, eventually reaching five boxes by the evening? Does he eat real food as well, or is he always full? Sure, maybe this habit stops his mouth from being “gross-feeling,” but at what cost to his stomach? I was skeptical about Spicer’s claim that his doctor gave the all-clear for this vice, but turns out, it’s more of a societal taboo than a digestive one. Regardless, I’m against it. And don’t even get me started on his feud with Dippin Dots. It’s a fact of life: Everybody poops. But despite the fact that we all do it, people don’t talk about it that much. (Probably for the best.) Still, there are a lot of things you can learn (healthwise, at least) from what's going on in your bowels. So it’s completely natural that you’d want to know whether your poop habits are on the healthy side of things. We consulted a few top M.D.s for their input. Here are your most pressing poop questions answered, plus how to know if something is not quite right. Your poop should be in a spectrum of earth tones, Dr. Staller says. That means brown, green, and yellow are all A-OK. However, Andy Barnett, M.D., of Legacy-GoHealth Urgent Care, says black or very dark poop could be a sign that there’s a problem with the lining of your intestines—so you’ll want to get that checked out. And excessively smelly poops can be a sign that you have bleeding in your GI tract, Dr. Staller says, but it can also happen when you take iron pills or an upset-stomach medication like Pepto Bismol. One thing that gets googled a lot: Beets can change the color of your poo to look bloody, but, yup, it's just that you ate beets. 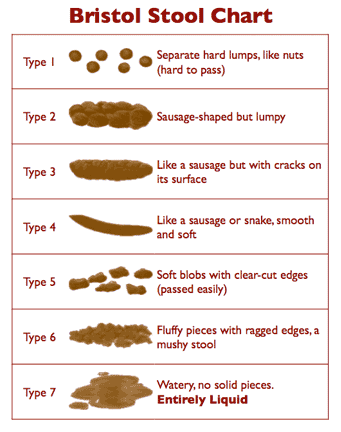 There’s actually a chart of poops, called the Bristol Stool Scale, that breaks down the different types of poop people can have and what they mean. The scale ranges from a Type 1 (separate, hard, rabbit-poop-like lumps) to Type 7 (liquid poop with no solid pieces). “We usually think around a Type 4 is normal,” Dr. Staller says. “It should look like sausage or a snake—smooth and soft.” If your stool is loose and watery, and you’re going more than three times a day, or you have very thin or pencil-shaped poop, Dr. Barnett says your body could be telling you something is wrong. It could be a symptom of diarrhea if it happens occasionally. If these types of stools occur regularly, it might be a sign of colorectal polyps, which are linked to colon cancer, so contact your doc ASAP. You’ve probably heard that you want to aim for poops that float (and mentally high-five yourself if you have one), but Dr. Staller says people make too much of this. “If your stools are consistently floating with any amount of oil or grease, it could be a sign that you’re not absorbing enough nutrients or fat,” he says. “In general, all of us will have stools that sink or float depending on how much gas is in it.” Dr. Staller says its really doesn’t matter whether you sink or float, noting that everyone will have both at some point. How long should it take to poop? Of course, Dr. Barnett stresses that everyone is different and what may be normal to you may not be for someone else. If you’re unsure about whether your poops are normal or if you have concerns, flag them for your doctor. Hartford HealthCare includes a tertiary-care teaching hospital, an acute carecommunity teaching hospital, an acute-care hospital and trauma center, two community hospitals, behavioral health services, a primary care physicianpractice group, as well as cancer centers, regional and senior home care and physical therapy rehabilitation. Here's what you need to do to protect yourself. Every year, you’re encouraged to get a flu shot before flu season rolls around, and you may or may not actually take that advice. This year, the Centers for Disease Control and Prevention wants you to know that, yes, you really should get that flu shot, even if you think it's too late. According to the CDC, there has been a “slow but steady” increase in reported flu cases in November and December, with numbers expected to increase still. The CDC is also tracking people who visit their doctor with flu-like illnesses and found that the rate of patients seeking care for the flu is now higher than normal. Robert Korn, M.D., medical director at Northwell-GoHealth Urgent Care, tells SELF that flu activity this year is "widespread." "Usually we aren’t able to get an accurate view of a particular season until it is over, however, so far this year the H3N2 strain is making people sicker than other strains of the virus," he says. People with the flu most commonly develop a fever, cough, sore throat, runny nose, chills, fatigue, and body aches, although some may also have diarrhea and vomiting, the CDC says. Flu season typically peaks after the holidays, Adalja says, with an influx of cases in February. While seasonal flu viruses can be detected year-round, the CDC says cases are often seen October through May, with the most occurring between December and March. If you haven’t gotten a flu shot yet, there’s still time. “The flu vaccine helps,” Marc Leavey, M.D., an internist at Baltimore's Mercy Medical Center, tells SELF. “With many months to go on the current flu season, if one has not yet received a flu vaccine, they should absolutely should get one.” Korn agrees: "It’s still not too late to get a flu vaccine." However, Adalja points out that it takes about two weeks for the vaccine to give you protection, so the earlier you can get it, the better. And, if you're wondering, the virus any flu vaccine you get is inactive, meaning you absolutely can't contract the flu from it. If you're pregnant and waffling on the shot, Yvonne Bohn, M.D., an ob/gyn at Providence Saint John’s Health Center in Santa Monica, California, tells SELF that you definitely should get it. "When you're pregnant, your immune system is already weakened because you're carrying the fetus," she explains. "Your system is depleted a little bit—as a result, you get much sicker, much longer, and it’s much more severe." That's why the flu shot is recommended for all pregnant women, regardless of how far along they are, she says. Adalja says you can also try to stay away from crowded areas where people may be carrying the flu, although he admits that's tough to accomplish. “It’s hard to minimize your risk other than getting the vaccine,” he says. “The flu is a very successful virus, and it can spread easily.” Some people with the flu have no symptoms at all, but those people are still contagious, he points out. And, for those who do actually develop symptoms, they’re contagious starting the day before they symptoms appear. “Those are some of the tactics this virus uses to be so prolific in its spread,” Adalja says. If you have the flu or think you’re coming down with it, Leavey recommends staying home from work to limit exposure to other people and seeing your doctor. Antiviral medications can work if you take them within the first few days of getting the flu, he says, especially for the H3N2 virus. “Current strains shows that they are susceptible to those medications,” he says, adding that it’s also important to stay well-hydrated. But experts stress that you really, really should get a flu shot if you haven’t already. “It’s important to remember that flu is something we have to deal with year-round,” Adalja says. “It’s one of the most prolific infectious diseases and will remain a threat.” So, getting your flu shot now can protect you during this flu season and from contracting the disease during other times of the year.